Spoiler alert: it’s absolutely a positive one. I’ve heard some weird eliquid names over the years, but Gloop is one that genuinely made me chuckle for a moment. I mean, isn’t gloopiness a bit of a bad thing when you’re vaping? No one likes gloopiness around the mouthpiece. Nor do they like too much gloopiness around the coil. Gloopy eliquids tend to be messy to deal with and burn through your coils quickly, too. I’m hoping that’s not a sign of things to come. Gloop is made in the UK by Gower Enterprises Ltd., which is the same company behind ECigaretteDirect’s Halo range, and they’re only available in high-VG short fills, no mouth-to-lung juice. From the ingredients on the bottle, you can see that it’s 70% VG and 30% PG. Being a 0mg nicotine short fill bottle, you add a nic shot bottle to make it up to 3mg, and I was sent Plusnic Nicotine Booster — 10ml, 18mg/1.8%, 70/30 VG/PG, £1.99. The 50ml short fill bottles are £14.99, and you DON’T get nicotine shots included. 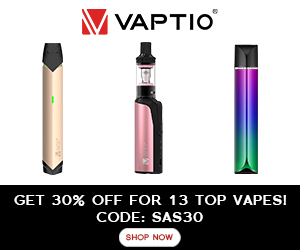 I asked the folks at ECigaretteDirect because I didn’t really understand the wording on the website, something I mentioned in a couple of my other reviews. It states “nic shot ready”, but I think that could be read/misread either way — included or not included. You’ll need to buy them separately, though. If you want the ones that I used, you’ll find them HERE. Sorry … why are we turning into monsters? It didn’t turn me into a monster, although it could be argued that I’m monstrous enough already. So, I’m gonna be honest with y’all. I have a box of juices (three small boxes plus a big one actually) that I need to work my way through and review. I’m trying to do them in some sort of order, starting with the ones that were sent to me far too long ago. Well, I made the mistake of opening this little Gloop beaut and giving it a good sniff. It was game over for the rest of the juices in the boxes. Hazelnut Cookie smelled SO DAMN GOOD that I mixed it up right away. Nicotine in. Shake, shakity-shake. Vape, vape, vape. I didn’t wait for it to steep. I barely gave my coil time to prime. Livin’ life dangerously, but it was totally worth it. Do you remember when I reviewed the high-VG version of Hazelnut Cookie by Sugar Pie Vapes? Well, that SPV one actually disappointed me a little bit because I felt it didn’t have enough flavour. I love hazelnuts. And I love cookies. I want an eliquid that actually tastes like hazelnuts and cookies, but I felt the Sugar Pie Vapes one was super-muted and didn’t pack halfway near as much flavour as it should have done. The 50/50 VG/PG version was better, but that’s no good if you’re looking for big clouds, right? This one — Hazelnut by Gloop — is fricking lovely, packed with flavour, and addictive. Like, super addictive. It’s another of those juices that I poured into my tank, time after time, and I must have used half of my 50ml short fill bottle in about two days. The taste itself is actually quite hazelnut-esque. I have zero complaints. There’s enough to taste like hazelnut, but not too much that it tastes peanutty-burnt. At the same time, I’m sure I could taste a distinct hint of chocolate in there on the exhale, but I can’t find that anywhere in the description or ingredients. I’m adamant it’s in there, though. Who has a hazelnut cookie without chocolate anyway? I know what you’re all thinking … But is it super gloopy? Despite the name, Hazelnut Cookie by Gloop isn’t actually that gloopy. I don’t think I went through my coils any quicker than I would have done with any other high-VG juice, and I really did chain-vape with this flavour. I don’t personally think this juice produces quite as much vapour as a few other 70/30 juices I’ve tried recently, but I don’t think it ruins the experience or anything like that. The Sugar Pie Vapes Hazelnut Cookie high-VG juice produces a lot more in the way of clouds, but the flavour is sacrificed a bit. That’s my opinion, anyway. They’re both 70/30 eliquids, but in the same device, with the same tank and coil, I just felt that Gloop’s offering was more focused on flavour than clouds. Gloop’s Hazelnut Cookie is also perfect if you’re looking for a smooth throat hit. It’s not non-existent, but it definitely isn’t harsh on the back of the throat. It’s just right for me. So, yeah, I really like this one. If I were to put together a hazelnut cookie eliquid, this is pretty much the taste I would want it to have. I’m finished with my 50ml bottle now. All vaped up. And I’m sad about it, too. Hazelnut Cookie by Gloop is a 5/5 🌟 eliquid for me. Would I buy Gloop Hazelnut Cookie eliquid again? A hint of chocolate, a decent helping of hazelnut goodness, and a light sprinkling of biscuity-cookie crumbs … I miss it already. I will absolutely buy this beaut again. Multiple times, I imagine. Would I recommend Gloop Hazelnut Cookie eliquid to you? This eliquid is quite sweet, but that’s just what I like, so it works really well for me. If you prefer a light and refreshing vape juice, you might find this one a little on the heavy and sickly side. If you like helping yourself to multiple servings of actual hazelnut cookies, on the other hand, I’m predicting you’ll love it just as much as I did. HONESTY POLICY: The Gloop eliquid range was sent to me by ecigarettedirect. I did not pay for these products. I was not paid for my review and I will not be paid for my review. All opinions are mine and in no way influenced by the brand/manufacturer. Please see Disclaimer for more details.